This season, enjoy the taste of fresh fruits and vegetables. Take the time to shop at your local farmers market and shop for produce that adds colorful nutrition to your Summer menus. Go early in the morning, when the selection is best. Try a new vegetable that you have not tried before, such as Japanese eggplant or gooseberries. Select the most brightly colored produce, because it’s often the most healthiest, like yellow tomatoes or orange bell peppers. In selecting berries, especially blueberries, strawberries, raspberries, and blackberries, make sure that they are firm and dry to the touch. 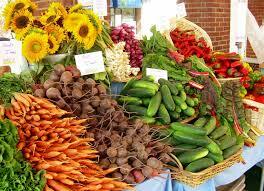 Always be flexible when shopping in a farmers market. Seasonal produce selection will change from week to week. 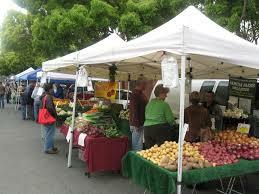 Make sure you talk with the vendors, because they know a lot about their products and may even offer a recipe or two. Input your ZIP code to find locations, hours, and other details. Seems like Brazil had been on my mind as of late, and I am obsessed with Brazilian cuisine, for the moment. 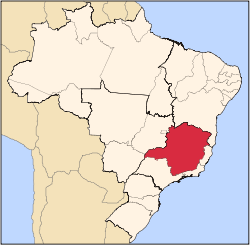 Minas Gerais, which can be translated into English to mean General Mines, is a Brazilian state hemmed in by the surrounding states of Sao Paula, Rio de Janeria, Gioas, Bahia and Espirito Santa. Minas Gerais was formed mainly by colonists who searched for veins of gold that was discovered in 1693. The state owes its name to what was once thought to be an inexhaustible resource for gold, iron ore, magnesium nickle, diamonds, emeralds, quartz, and semiprecious stones too numerous to list. These abundant riches came from the naturally occurring itacolumite rock that can be found in great numbers in the region and were most likely the result of a meteor striking this areas millions of year ago. The mineral rich center is Ouro Preto, once the seat of Minas Gerais government. The current state’s capital and largest city is Belo Horizonte, and is a major urban and finance center in Latin America, and is the sixth largest municipality in Brazil, after the cities of São Paulo, Rio de Janeiro, Salvador, Brasilia and Fortaleza. Minas Gerais is also known nationally throughout Brazil for its rustic and hearty cuisine. The multicultural basis for many of the dishes are the home cooks who reside in the small regional farmhouses that dot the countryside, and many of the dishes are prepared using locally produced vegetables and meats, especially chicken and pork. Traditional cooking is done using coal- or wood-fired ovens and heavy clay or stone vessels called “panela de barro”, carved from soapstone, making for a particularly tasty flavor. Even some restaurant chains have adopted these techniques and made this type of food popular in other parts of the country. The one dish that stand out is the traditional meal of Frango com Quiabo (Chicken and Okra Stew) and it is beloved alike by everyone from Minas Gerais state. “…true patriotism is found in th e sensuality of eating, in meals and desserts…[for me] it is that truly Mineiro main course; chicken stew with okra and winter melon gourd and polenta, a delicate dish, viscously sliding down like life itself, but dripping with chilli pepper”. With that passionate endorsement, I think that you are going to love it too! Enjoy! Wash and dry the chicken. In a large bowl, toss the chicken with the garlic, salt and pepper and refrigerate for 1 hour. In a large skillet, heat the butter over medium heat and saute the onions for 5 minutes, until they are lightly caramelized and are golden yellow brown in color. Remove onions and set them aside. In the same skillet heat the vegetable oil and olive oil over medium heat. When the oils are shimmering, add the chicken pieces and saute them until skin is crisp and golden. Drain on paper towels and reserve. Drain off the excess oil and reserve in a small pan. Add the chilli peppers and turmeric and sauté for 2 minutes. In a large saucepan, add chicken stock and it bring to a boil. Reduce the heat and continue to cook at a low simmer. Generously coat a cast iron skillet with vegetable oil and heat over medium-high heat for about 5 minutes. Add the okra and stir constantly with a wooden spoon for about 12 minutes to remove all the excess water from the okra. You will note that the gummy residue will stick to the side of the pan. Remove the okra from heat and set aside. Add the chicken and the onions to the simmering chicken stock and cook for an additional 10 minutes, until pieces are cooked through. Add the okra and season with salt and pepper. Add the malagueta oil or hot pepper sauce and cook for another minute or two. Serve the stew with polenta or steamed rice and an endive salad. In a large saucepan, bring water to a boil over high heat. Add salt and reduce the heat to a simmer. Slowly add the polenta, stirring constantly with a wooden spoon. Cook and continue stirring for 20 minutes. Add the corn kernels and cook for another 5 minutes or until the polenta is smooth and slightly stiff, like southern grits. Remove from the heat and stir in the butter and the cheese. To save time, if you are in a real hurry and starving, you can purchase pre-made fried chicken from your local grocery store and skip the frying of fresh chicken. Okra, also called gumbo, Lady’s Fingers or bhindi can be left whole if they are small on side. A chunky cornbread square would also be a nice accompaniment to this dish. Traditionally, Frango com Quiabo made by the people of Minas does not use cilantro to flavor this dish. However,cilantro is used by home cooks who live along the coast. Photo Credit : Test 4 the Best, 2010. The Portuguese salted cod is one of the most favorite foods found in the cuisine of Brazil and has found its way into many Brazilian dishes, such as this egg dish, Ovos Mexidos com Bacalhau e Batata (Salted Cod with Scrambled Eggs and Matchstick Potatoes). This dish brings together the three favorite foods of the Portuguese: salted cod, eggs, and potatoes. Sometimes, in the Spanish tradition, it is called Bacalhau Dourada, or Golden Cod, the dish is composed of a velvety pillow of softly scrambled eggs mixed with onion slices, bits of salted cod, and crispy matchstick potatoes.This dish is so delicious as meal unto itself, any time of the day for breakfast, lunch, dinner, or even brunch. …….And it is just in time for the 2014 World Cup! Enjoy……Ole, Ole Ole…..
1. Rinse the fish and place it in a large bowl. Cover completely with cold water. Refrigerate for 48 hours, changing the water 4 to 5 times. 2. The next day, drain the fish and transfer to a large saucepan. Add vinegar and enough water to cover. 3. Bring to a boil, and simmer until the fish flakes easily, about 15 minutes. Drain and cool. Remove the skin and bones and shred the cod into needle sized pieces with a fork, to yield about 2 cups of shredded cod. 4. Shred the potatoes, using a mandoline. Wash potatoes in cold running water to remove the starch. Place potatoes in a large bowl, over with cold water and refrigerate for 20 minutes. Drain the potatoes thoroughly and dry with paper towels to remove as much of the surface waster as possible. 5. In a deep fryer or heavy saucepan, heat the oil to about 350o F and fry the potatoes in batches, to a golden yellow color. Drain on paper towels and reserve. 6. Add 1 tablespoon of the olive oil to a medium cast iron skillet. Add the onion and bay leaf and saute until golden, about 15 minutes. Discard the bay leaf. Reduce the heat to low. Add the remaining 2 tablespoons oil to the onion slices in the skillet. 7. Select another skillet that is medium sized and nonstick. Heat 1 tablespoon of olive oil. Add the eggs and stir for about 2 minutes, or less until lightly scrambled. Add the onion, cod and fried potatoes. Season with pepper and few dashed of malagueta oil (or hot pepper sauce) and cook for another minute or so. The eggs should be creamy and light. To serve, transfer the eggs to a plate and sprinkle with parsley and black olives, which are optional. If a mandoline is not handy, you can grate the potatoes using an old fashioned held hand grater. Another alternative is to use the grater attachment of a food processor to shred the potatoes. 3 large russet potatoes will yield approximately 6cups of potatoes, when shredded. Canned fried matchstick potatoes can be used as substitute for the freshly grated match stick potatoes. Salted cod is available at Italian markets as baccalà and at Spanish markets as bacalao.